It’s become a tradition, as we head towards the end of another #MedComms Day, that Sarah Smith, a freelance medical writer and editor based on her boat in the Caribbean reminds us that you can freelance in #MedComms from anywhere these days… today that’s Calvigny Island in the background. A playground for the rich and famous apparently! Well played, Sarah! It’s been a tough day trying to concentrate on an assignment I am working on, my ears are still ringing with the sound of rock and roll from last night. Along with some other 50,000 fans and my concert buddy, who incidentally works in pricing and market access, we went to see the Rolling Stones at the Old Trafford Stadium Manchester last evening. After over 50 years of touring, Mick Jagger and co-workers can still draw crowds, fill a stadium and BTW it’s not just ageing rockers that attend. How can they still do this in 2018?. Well charisma, great songs, skilled musicians and a stunning show is probably the answer. You’re probably thinking what on earth has this got to do with MedComms? What occurred to me last evening were the parallels with organising a successful satellite symposium or conference i.e. when the event you have organised fills the auditorium or congress room and there are no seats left. So what get you this level of success? Charismatic and expert speakers with great presentation skills, interesting content that will resonate with the audience and finally, excellent delivery and organisation of the event. I would say no different to a great rock concert. And to any of you Stones fans out there in the MedComms world “Its only rock and roll but we love it”! Jill Kaige is a freelancer specialising in manging Zinc MAPS and Vault Promomats, based in Oxford. Hello and happy MedComms Day! I’m posting at the end of my day as it’s been one of false starts. I started the day in the garden making an epic list for myself, and am ending it in the same place now that the sun has moved and I can see my screen again. Today I’ve been tying up some loose ends in Zinc from yesterday and have been getting to grips with a large offline reference pack. I am not a writer so I am grateful to have support from those with superior writery knowledge when needed, and today is one of those days. When I started as a freelancer I had no other contacts at all (!) and now I have a nice big list of them (partly thanks to Peter! 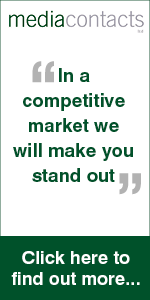 ), plus a small team of trusted subcontractors. I feel as if that, paired with the option to work outside, and to be flexible around my daughter’s childcare makes my job nothing short of perfect. Here’s to many more MedComms Days. My role as Patient Partnership Liaison at Envision Pharma Group is incredibly varied – today I have been handling project management for the team, writing a newsletter, planning an internal training program and thinking about our next piece of patient-focused research. The area of patient involvement in drug development and medcomms is growing rapidly, and is an exciting space to watch! Sarah Smith, freelance medical writer, set sail from the UK some years ago and hasn’t looked back. You can work from anywhere in the world with MedComms! Morning everyone! I’ve just got up here on our boat (our home and my office) in not-so-sunny Grenada. I have a morning working on a writing project and a BBQ on the beach planned for this afternoon. At least if it rains the rain will be warm! Life can be a beach sometimes! Julia Davies is a freelance editor. Greetings from sunny Worthing! Today, like most days, is a day of juggling… editing projects from various clients, studying for my coaching diploma, a quick session at the gym, and an all-important break at the beach. I’ve been editing for over 10 years, and I particularly appreciate the flexibility and variety of freelancing; it enables me to do a job I love alongside my studies, as well as mostly (!) managing to achieve that elusive work–life balance. I love hearing from others around the world on MedComms Day and seeing how flexible and full of variety our industry is! 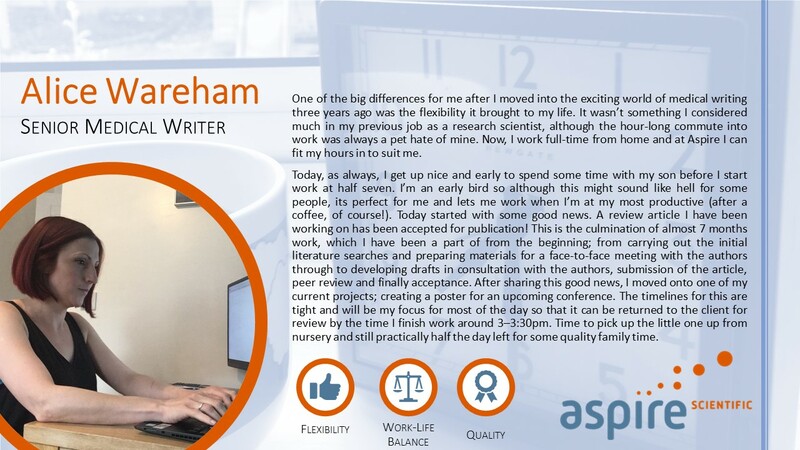 Alice Wareham is Senior Medical Writer at Aspire Scientific. One of the big differences for me after I moved into the exciting world of medical writing three years ago was the flexibility it brought to my life. It wasn’t something I considered much in my previous job as a research scientist, although the hour-long commute into work was always a pet hate of mine. Now, I work full-time from home and at Aspire I can fit my hours in to suit me. Today, as always, I get up nice and early to spend some time with my son before I start work at half seven. I’m an early bird so although this might sound like hell for some people, its perfect for me and lets me work when I’m at my most productive (after a coffee, of course!). Today started with some good news. A review article I have been working on has been accepted for publication! This is the culmination of almost 7 months work, which I have been a part of from the beginning; from carrying out the initial literature searches and preparing materials for a face-to-face meeting with the authors through to developing drafts in consultation with the authors, submission of the article, peer review and finally acceptance. After sharing this good news, I moved onto one of my current projects; creating a poster for an upcoming conference. The timelines for this are tight and will be my focus for most of the day so that it can be returned to the client for review by the time I finish work around 3–3:30pm. Time to pick up the little one up from nursery and still practically half the day left for some quality family time. Greetings from a freelancer in Sweden! Another great view from Kris Rydholm Överby. This year, MedComms Day falls on our Swedish National Day Holiday! Everyone is enjoying bright sunshine and lovely weather as we proudly display the Swedish flag at home. Greetings from me to everyone on MedComms Day from Sigtuna, Sweden, founded by the Viking Erik the Victorious in the year 980. I will go back to work now so we can light the barbecue and celebrate Swedish National Day later this afternoon! Mark English, freelance writer, is preparing for some serious traveling over the coming days. Ping him a message if you want to meet up and hear about freelance life in New Zealand – and those views. Oh, those views! It was a cold start here in Wanaka, New Zealand with overnight snow on the mountains and mountain passes, so the log fire was cranked up well before work began. Like most freelancers in New Zealand, the start of my day consisted of catching up on emails that arrived overnight from various parts of the globe. I then incorporated some minor comments on an oncology e-learning tool and the rest of my day was spent organising an upcoming trip. Living in New Zealand, I don’t get the chance to meet clients very often, but we (myself and my better half) are heading on an overseas trip on Saturday visiting old and new clients in San Francisco, New Jersey, Philadelphia and the U.K. We are also throwing in an advisory board meeting in Barcelona just for the fun of it and then finally we are spending some time with family in the Lake District U.K. (can I order sunshine there please?). I have been a medical writer for 18 years now and I still absolutely love my job and the variety it brings. Anyhow, less of the I love my job warm fuzzies, does anyone want to meet me for a coffee and a natter on my travels? Yes? Fantastic. Here is my email address —-> mark.english@bellbirdmedical.com. And finally, I will leave you with a much-requested photo. Here is tonight’s sunset over Lake Wanaka. If you look very closely, you might see Mt Aspiring in the far distance, New Zealand’s second highest peak at 3,033 metres! 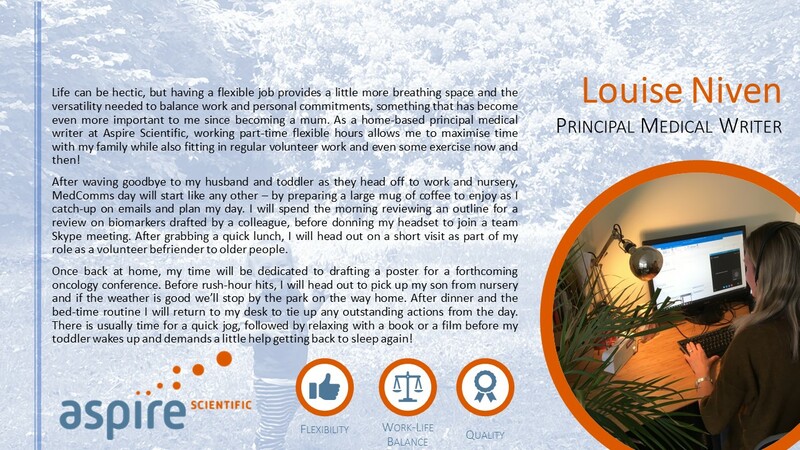 Louise Niven is Principal Medical Writer at Aspire Scientific. Life can be hectic, but having a flexible job provides a little more breathing space and the versatility needed to balance work and personal commitments, something that has become even more important to me since becoming a mum. As a home-based principal medical writer at Aspire Scientific, working part-time flexible hours allows me to maximise time with my family while also fitting in regular volunteer work and even some exercise now and then! After waving goodbye to my husband and toddler as they head off to work and nursery, MedComms day will start like any other – by preparing a large mug of coffee to enjoy as I catch-up on emails and plan my day. I will spend the morning reviewing an outline for a review on biomarkers drafted by a colleague, before donning my headset to join a team Skype meeting. After grabbing a quick lunch, I will head out on a short visit as part of my role as a volunteer befriender to older people. Once back at home, my time will be dedicated to drafting a poster for a forthcoming oncology conference. Before rush-hour hits, I will head out to pick up my son from nursery and if the weather is good we’ll stop by the park on the way home. After dinner and the bed-time routine I will return to my desk to tie up any outstanding actions from the day. There is usually time for a quick jog, followed by relaxing with a book or a film before my toddler wakes up and demands a little help getting back to sleep again! Lyndal Staples, Freelance writer, writes that she loves seeing what people are up to around the world on #MedComms Day. I’m currently working on some conference materials for an agency in the United Kingdom. I’ve spent all of this year aligned with the company and it’s been great working with the same team and having surety around the number of hours I’ll be working and the timeframe in which I’ll get paid. Long-term contracts like my current one definitely have their upsides, although there’s always a bit of nervousness about retiring my other clients, even if it’s just for a few months. I’m looking forward to following the feed for MedComms Day 2018. It’s great to see what everyone is up to in this around-the-world, around-the-clock business of ours. It’s easy to feel a bit out of touch being a freelancer (especially one at the bottom of the world…), but it’s days like these that I definitely feel part of a big global community. Well, we’re into the middle of winter here in NZ and it’s freezing today, while our Northern Hemisphere colleagues enjoy the longer nights and warmer weather of summer. So, we’re up in the dark as usual at this time of year, triaging the briefs and requests for support that have come in overnight, while trying to manage a 2-month-old and wrangle a 3-year-old. Right, got to run. Nappies to change and children to feed. It’s become traditional on #MedComms Day now to have a photo sent in by Sarah Smith, a freelance medical writer and editor based on her boat in the The Caribbean to remind us that you can freelance in MedComms from anywhere these days… today it’s Turtle Bay, Trinidad.